A friend asked me to make her daughter's ball gown for her end of year ball in September. They had looked around but nothing was what Miss V wanted. Miss V had some definite ideas as to design and so M decided to check with me. Miss V made me a rough sketch, with a description, plus gave me some pictures that showed design aspects she liked. Miss V had chosen a lovely silk chiffon for the outer layer and wanted lace sleeves so went off shopping again with mum to find some, which they did at The Fabric Warehouse. So the design and fabric choices are Miss V's 😊 I did my best to interpret her design ideas. 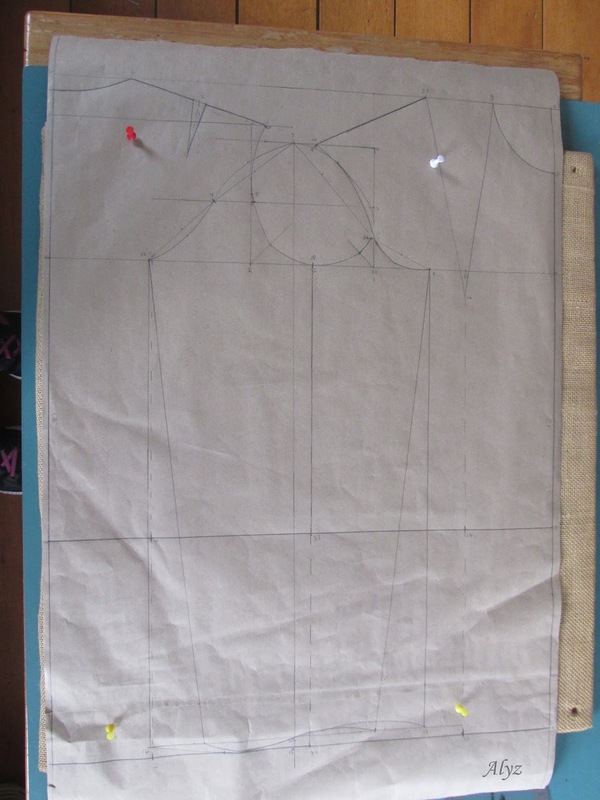 From there it was measurements, draughting a block and making a toile. So here is the final one of the draughts I did, possibly the first! At that stage I was thinking myself pretty clever having mostly got the hang of this draughting business! Well!! That thought quickly evaporated at the first fitting 😕 I did another tweak of the draught, fitted that, still some issues . . . another draught. Check the measurements . . . hmmmm that armscye doesn't really match up with the numbers in the book . . . . oops, re-measure armscye which solved most of the problems strangely enough! These photos are from the second fitting, I think. I had to make a few more tweaks . . .
. . . and did another fitting to make sure the bodice fitted. 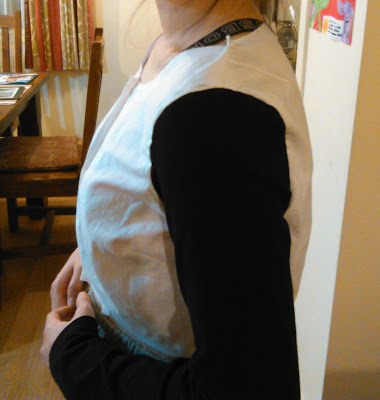 I did suggest the bodice be quite a bit more close fitting than it is but Miss V was very determined to keep the style she wanted and she is the client so that is what happened. For the skirt I looked through my pattern stash to see what I had. I found this pattern that was given to me a while ago. It's a vintage one, by the price and the fact that it has no markings. Someone had previously written on the pattern pieces which was a help! I've never used a pattern as old as this but I have read about them. They have circles punched out for the markings. And thankfully a guide to tell you what they are although I was able to work most of them out! I didn't get photos of most of the making but I did take one of the pleating on the front. Miss V wanted a soft look. I showed her examples of pleating and gathers and she went with the pleats. 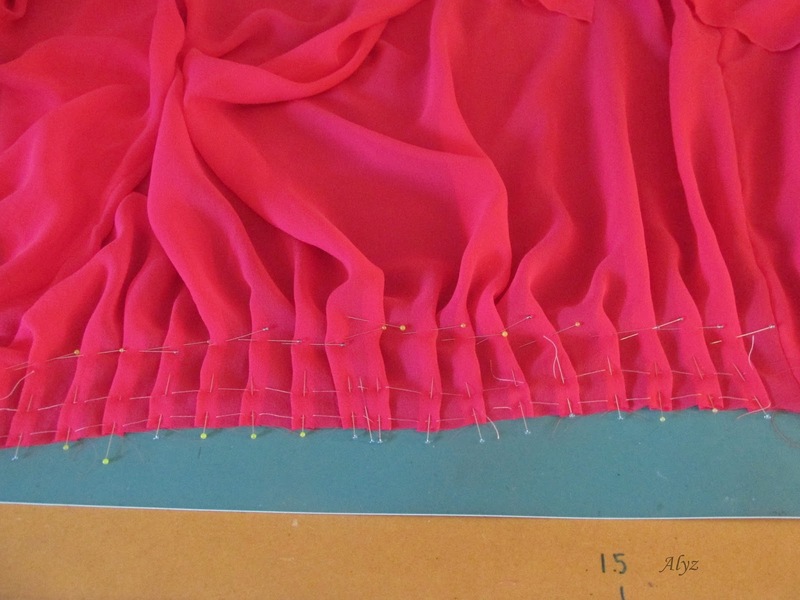 A bit of maths was involved figuring out the width of the pleats and how much fabric needed. 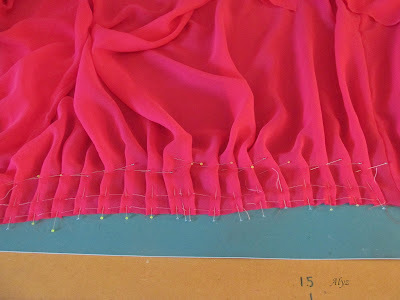 Then there was folding, pinning and basting the pleats in place before I stitched the skirt to bodice. 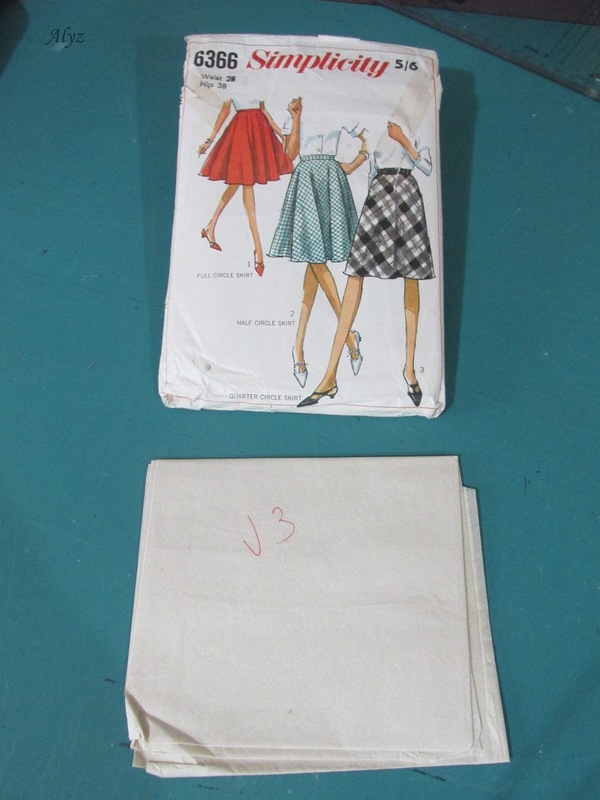 To reduce bulk at the waistline the lining waist seam was the same measurement as the bodice waist measurement. Lots of pins! These are Clover glass head silk pins. 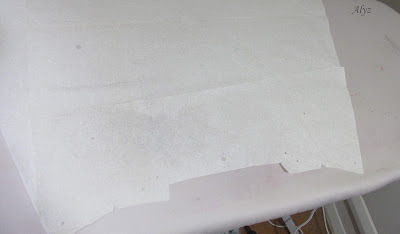 I love them and they are great for fine fabrics such as this silk chiffon. I think I am in danger of becoming a pin snob! After using these pins a year or so ago I found the regular thicker ones, which aren't that thick really, seemed so much thicker that I reach for these pins all the time now. They are great and the glass heads are heat resistant so when you are using the iron the heads don't melt. I've done that a lot - melted the sides of pins that is. As well as the dress Miss V requested a cape to wear for added warmth. I used this pattern I had in my stash and used view A, E with a centre opening. The cape was lined as well. I was very happy to receive some photos of Miss V in her ball gown from the night of the ball. I think Miss V looks gorgeous. It was a special day and night for her as she had her hair and make-up done especially for the ball. A couple more photos which show off the stretch lace sleeves. 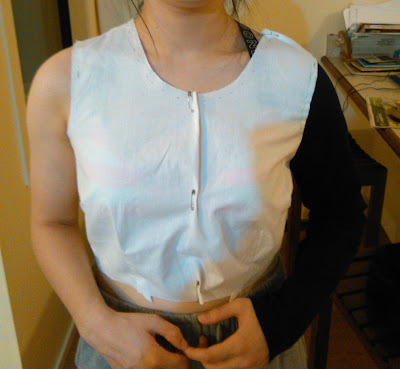 Being a stretch fabric meant I was able to make the sleeves really fitted. 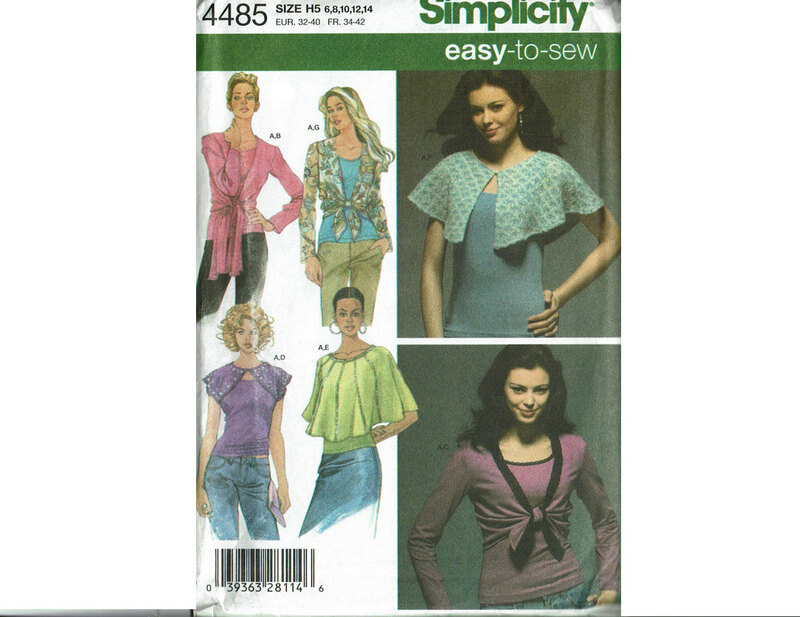 I draughted a new pattern for the sleeves as the measurements for non-stretch and stretch are different.